Simple and minimal private photo sharing. Many alternatives to common photo sharing are emerging. iPhone users are more and more challenged to make use of their photos in new creative ways and to take advantage of photo sharing also as a way to tell others something meaningful. Tracks can be used simply to share photos, but also to tell a story, compose a visual essay, or simply put together a thematic collection with photos you take with your iPhone. The idea behind Tracks is nice, but I was not completely convinced by its actualization: in the present state, Tracks looks more like a service still in need of testing than like a full-fledged sharing platform. The interface is minimally designed and very slick, but features are also very limited. All in the name of simplicity, but exaggerated simplicity is not always desirable. Users create a profile and then they can either load photos from their device or use the built-in camera feature. By loading photos, users create albums (or tracks, if you wish) they can share with people they personally choose, like friends and family. 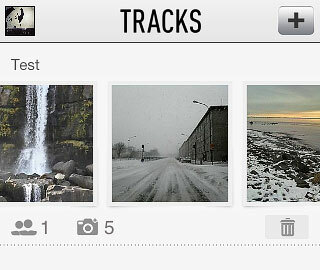 Whole tracks can be deleted as well as individual photos in them. From Tracks website you can have an overview of all the tracks you have created. Right now, Tracks is a hassle-free app that makes it possible to privately share photos — which is something, it must be said, several other services allow as well and with more options. 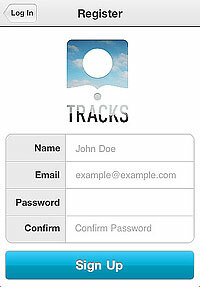 But Tracks has the potential to become something more refined and useful: we will be looking forward to future updates. Tagged as: photo sharing, Tracks, Tracks Media Inc. Previous post: ScratchCam on Sale!